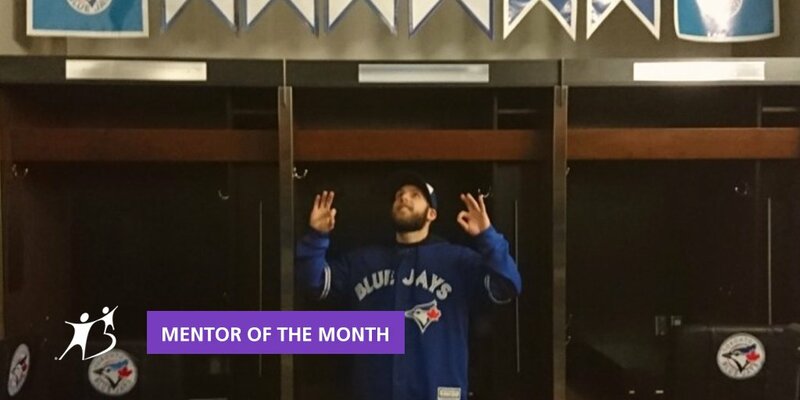 Our April Mentor of the Month is true to the Waterloo Region community! Scott, a new Special Constable with the University of Waterloo Police Services now has been a part of all three major post-secondary institutions in Kitchener/Waterloo having attended Conestoga College for Police Foundations and Advanced Police Studies, as well as Wilfrid Laurier University for a Bachelors Degree in Criminology. Including his experience with In-School Mentoring for 7 years at Big Brothers Big Sisters of Waterloo Region, Scott has experienced life across the education system in the Waterloo Region, part of what makes this community so incredible! Scott is another volunteer that came to us through the Police Foundations program, like many of our volunteers do. The program emphasizes the importance of volunteering on the community, and Scott decided that the support he would be able to provide to a younger person in Waterloo would create the largest impact. “After my first year of In-School Mentoring, I realized how much fun I was having every week with my Mentee, and the decision to continue volunteering with Big Brothers Big Sisters was an easy one.” The way Scott explains his experiences with In-School Mentoring is a sentiment that many of our volunteer’s experience. It isn’t just the Little that benefits, the joy, the learning experiences, the teaching experiences; These are all valuable to the volunteers as well. It means so much that with volunteering experiences including Out of the Cold, Best Buddies Canada, and Wilfrid Laurier Accessible Learning Center, that Scott would choose to continue volunteering with our programs. Being our April Mentor of the Month, Scott understands that Mentoring means being a positive influence in a young person’s life and being able to provide them with the knowledge and experiences that he’s had himself, experiences that the Little might not have otherwise. “It’s important to have someone to look up to and trust. A little bit of time every week goes a long way to building a relationship and helping my Mentee to live out his full potential.” Everybody needs someone to look up, and Scott’s Littles are so lucky to have a Mentor like him—a person so willing to support his community and understanding of the needs of our youth (including the fun ones)! With his current Little, Scott gets to share and exchange stories and just talk, something that has impacted his Little in a drastic way. Knowing how excited my Mentee gets for our meeting each week is my favourite thing about volunteering. It’s a good feeling to know how meaningful our time together is to him. I love receiving positive feedback from the school staff regarding the growth and development of my Mentee at school… He was very quiet and shy at the beginning of the school year but has come a long way in feeling comfortable around me and sharing his stories.